I love to play with my kids. I don’t know why–before I had kids, I really didn’t play all thst much, and children ran screaming from me (literally), so I am honestly unsure of where this comes from. And if we can bond while play is happening, that’s like the best part of my day. So, my son was talking about the new Star Wars movie coming out soon (yipee!) and I thought, maybe he and I could bond a little over some obleek, star wars, and a couple legos. I sent him to find the legos and started working. 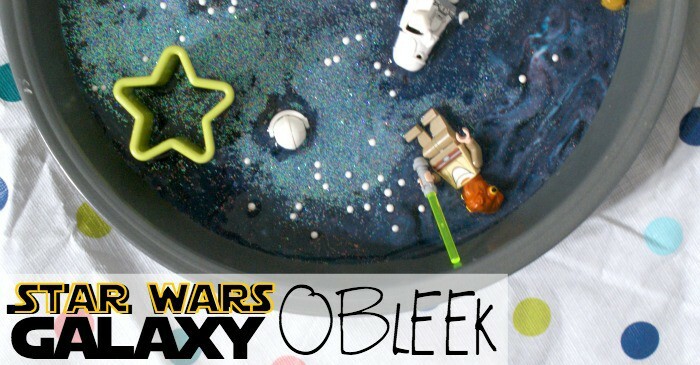 By the time he came back with our mini-figures, the Star Wars Galaxy Obleek was ready. 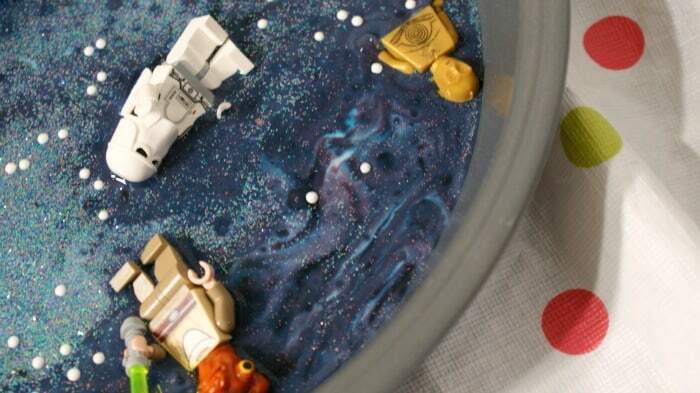 There’s just so much fun in this little bowl and so much educational opportunity, too. While we played, we talked about so many subjects: why the obleek had the liquid/solid properties; how the figures sunk like the x-wing did on Degoba; what pretend constellations we could make; how the food coloring worked to make that neat galaxy-like swirl. We really discovered a lot of things together–and I pretend “became one with the force” at the end and stepped back to let him play alone. It was a good time and I felt like we really made use of this easy 5-minute activity (even if he’s a little older). If you bond with your kiddo over this, let me know in the comments (finally got those working…). Mix the cornstarch with 2 tblspn of water. If mixture is too dry, add more water. Keep adding water until mixture is wet in appearance, but solid when touched. Add 1 tblspn glitter and spread gel food coloring in several locations. Mix well, making sure to get the color sort of choppy, but swirly. 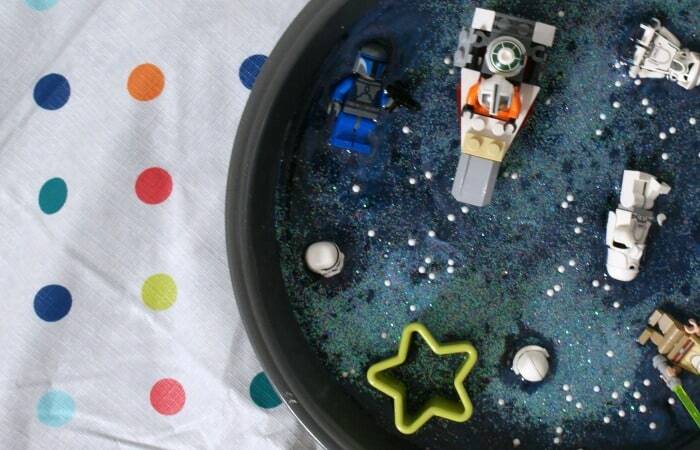 Place in your bowl where you intend to have the kids play. Sprinkle on the 1/4 tablespoon of glitter and sprinkles. Drop the lego men on top. 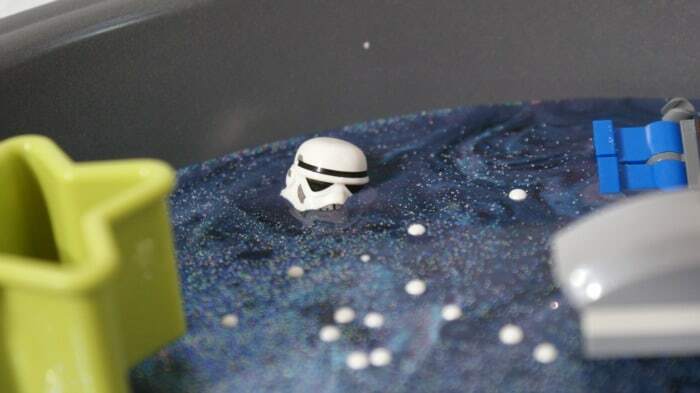 Get ready for some galaxy-fun!